CranioSacral Therapy works by helping the body’s natural healing mechanisms dissipate the negative effects of stress on the central nervous system. This is accomplished by utilizing a physiological body system called the craniosacral system, which maintains the environment in which the central nervous system functions. The craniosacral system consists of the membranes and cerebrospinal fluid that surround and protect the brain and spinal cord, extending from the cranium (head) down to the tailbone area (or sacrum). The role of this system in the development and performance of the brain and spinal cord is so vital that an imbalance or dysfunction in it can cause sensory, motor and/or neurological disabilities. For example, if the bite (or jaw) is out of balance, the whole head is out of balance, and often the whole body. How can something so gentle be so powerful? 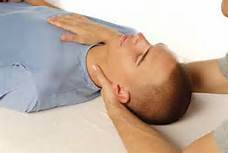 The craniosacral system has a rhythm that can be felt throughout the body, just like the pulse. I use a very light touch to monitor this rhythm from head to feet to pinpoint the source of an obstruction or stress. I can then encourage the natural movement of the fluid and soft tissues to help the body self-correct. This simple action is often all it takes to remove a restriction. Sometimes, like peeling layers of an onion, once some restrictions have released and balanced, others may show themselves and need attention. Secret Golf Tip Only the Pros Know!